On our first day in Bega, just over 2 years ago, Olive and I did all the normal things you do after you move to a new town where you don't know anyone. 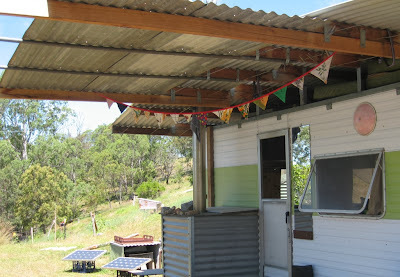 We visited our land, we visited the op shops, and we visited the local food co-op. At the co-op, we got chatting to a lovely and friendly chap who has, in the ensuing 2 years, come to occupy an important place in our lives. He was absolutely instrumental in helping us finish our house so we could move in (if you want to read about these adventures, check out pretty much any post from May, June or July last year). He supplies us with firewood (in exchange for an extended loan of my dad's chainsaw). He regularly joins us for dinner, brings us rabbits, gives excellent hugs, and is generally adored by all members of our family. And, if that's all not enough, Rohan Anderson referred to him as our "geologist turned wild man, Brett". Love it. Last Christmas, I gave Brett some bunting for his caravan, which he said reminded him of "the goofy greeting smile of a magical monster with unequal and colourful teeth". 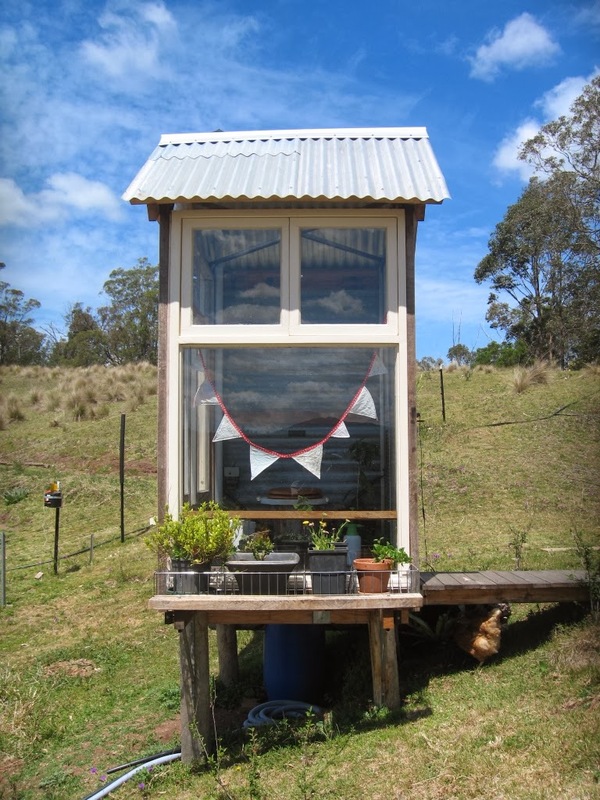 When Brett recently built his most excellent composting dunny/glasshouse/seed-raising shed (aka the Turd Temple), it was just crying out for some monster teeth to complete the forth face. And so it was with a great deal of pleasure that I sewed up some more teeth bunting for our friend Brett, our first friend in the Valley. 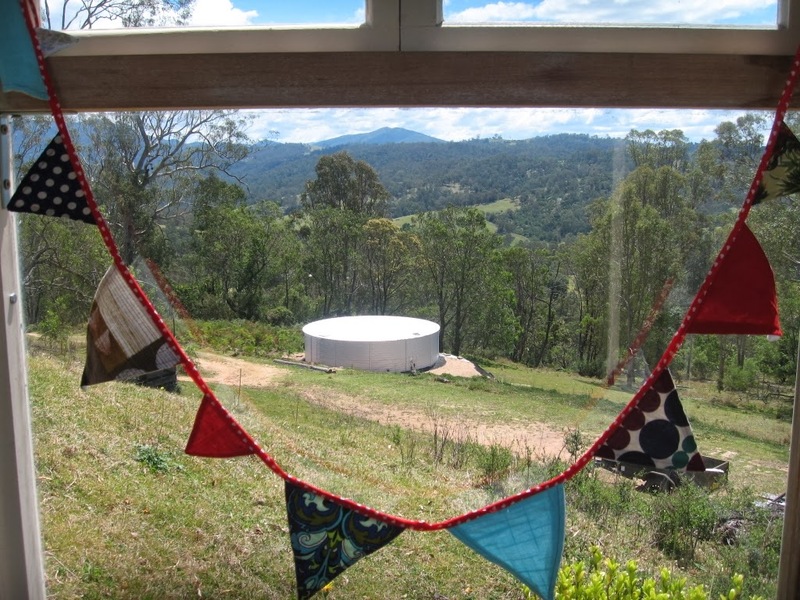 Bunting cradles the view north to Mt Murrabrine and Brett's fancy new water tank. We were recently more than just a little bit excited to be interviewed for ABC South East radio. It was fun, and nice to talk about our adventures in pastured poultry and CSAs. You can probably tell how excited we are by the fact that, as our friend Vickie lovingly put it "Ian can hardly get a word in". What can I say? We're passionate!! If you're interested, you can listen to the radio interview here. I may have mentioned once or twice before that I really love making custom clothes for people. Really, truly, and honestly love it. Whether this be a bolero or a dress for a special occasion or, more often, a skirt (or 3 or 4) for the new season, it's always fun, and it's always different. I love learning a little bit about people - what they're interested in (horses, chooks, wombats, plants...), what kinds of colours they love, and maybe a little bit about where and when they're going to be wearing the clothes I make for them. I love it when people send me photos of themselves wearing the clothes, and when they send happy little messages about how the clothes make them feel great. I love it when they give me lots of ideas, and I love it when they give me none, leaving the whole thing up to me. I love the fact that, because the skirts are custom - made to the exact measurements of the lady in question - they're going to fit just right. Because really, who's just a size 14? We've all got different bumps and big bits, we're all different heights, and we all like to wear our skirts at varying lengths depending on how we feel about showing off our knees/thighs/whatever. Which is why a custom skirt makes sense!! It's also nice to get something that's made by someone who's happy doing it (ie, not exploited), made from recycled materials (or not), using sun-power, that comes to you in the mail with a happy little note and some nice coloured sticky-tape on the outside. Don't you think? Tricia, from the lovely lovely blog, Little Eco Footprints obviously agrees, because she recently ordered a custom skirt from me, which I happily made for her today, sitting in the sun listening to Jordie Lane. It's made from a blimmin' beautiful zig-zag print sheet (from back in the day when Target still sold floral zig zag print sheets made from 100% cotton) and pockets of native bird teatowel, with my new favourite ric-rac fancy trim. Oh, and it's a wrap n' go, so it'll fit all the time, even when she's had a big delicious lunch from her garden. If you would like to have a nice-fitting skirt made just for you, by me, please send me an email - pearlandelspeth at gmail dot com. 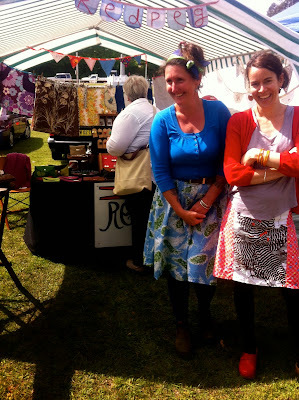 I'm really missing making custom skirts for people now that Georgie Love is gone (*sob*), so if you - or someone you know - are in the market for some spring/summer wares, my fabric collection and I are here for you. And, in case you didn't know, I also do gift certificates, so you can give ladies you love a custom skirt at prez-time. Fun, yes? Hip hip hooray for baking day! We've had our beautiful clay oven awhile now. And while we've cooked many a delicious pizza, we'd not yet done the all day bake-athon, that is, until last Sunday. Oh what a day! It dawned clear and sunny and mild. Spring! Annie was up super early to help at our local co-operative run Small Species Abattoir so sadly, she didn't really see the dawning of this grand Spring day. But when she returned home we set about making ourselves the perfect Spring brunch - soft boiled eggs, blanched asparagus and toasty herby breadcrumbs. We are experiencing egg abundance at the moment, and what a joy it is. There's something about having so many eggs that makes me feel very happy and very well fed. We sat on the grass in the sun and ate our fill and made plans and anticipated the festival of baking before us. Long before our wood oven was built, we'd harboured a notion that we'd fire up our oven and spend the day cooking. It makes a lot of sense and it's the way many people around the globe have been cooking for some time. It makes sense because getting the oven hot enough to cook pizza takes 3 hours so once you have "cooked" the fire that much, it seems silly not to make use of all that heat. A clay oven will hold its heat for some time and so goes our first baking day plan to make use of all that stored heat. I lit the fire around 10 in the morn and kept it going for well over three hours. It was a really good fire that built the heat of the oven well. Coals were raked to the side and the floor of the oven given a little wipe then first up in the hot hot oven goes pizza. We made use of what we had so our pizzas comprised asparagus and parmesan and parsley, homemade ham and chilli and mozzarella, tomato, fresh herbs and cheese, tomato and spinach and olives and cheese... It was all so very good. Especially as we finished it off with a homemade blackberry jam pizza dolloped with Tilba jersey cream. Eaten warm from the (hot hot) oven it was beyond pizza, really beyond description. So good. The piece de resistance! Blackberry jam pizza. Next up was bread. By now, the oven was at about 250 degrees (Celsius). Still a tad too hot but almost there. Now I need to confess something here. I am scared of sourdough. I have majorly ginormous blocks to making it. I made it once and it was terrible, like a rock. I've read books, I've done a course but still, I'm scared. But I need to sort myself out because we currently have an expensive bread habit. 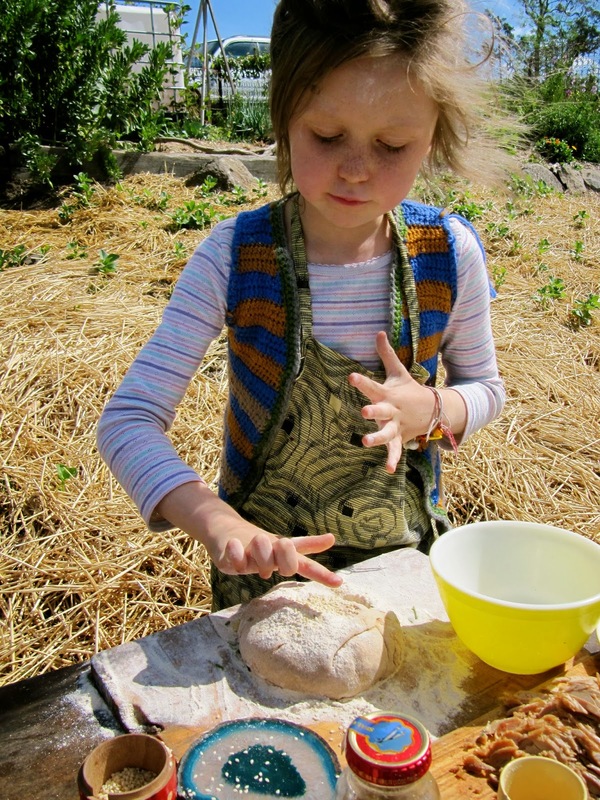 We really only eat sourdough because (a) I am a food elitist (b) it's how bread is meant to be (c) I want the kids to grow up knowing what real bread is (d) the fermented is good for our guts and thus, overall health. But there's a price to be paid for handmade sourdough and boy, do we pay it. So I need help and I need it fast. Gotta get that starter happening. In the meantime, I made some very delightful yeasted loaves of light sift flour and spelt with a little honey and olive oil. The next night when we ate some with our lentil stew I exclaimed out loud, "God, how good is this bread!" Olive promptly chastised me for "boasting". But I maintain it's ok to be proud of yourself sometimes. And proud I bloody was. Olive got busy making her favourite cheese, mixed fresh herb and sesame loaf. It's kind of like a Bakers Delight pull-apart, but different because the bread isn't white fluff. The oven was now at about 220 degrees and so it was time for biscuits. We made a sesame tahini pseudo-health biscuit and a sweet, buttery orange spice biscuit. Perfect lunchbox fodder for the week ahead. As the temperature continued to drop it was time for muesli toasting. I needed to do something to the raw muesli I'd made a couple of weeks before. It wasn't very nice. I don't know why, it's not like I'd never made muesli before but this batch was not inspiring any enthusiasm amongst anyone in the family. So mixed with raw local honey and olive oil it was and baked slowly 'til golden brown. Ah, that's more like it. And then it was time for sitting and cuddles and stories and drinking of homemade ginger beer. Quite fortuitously Annie found a long forgotten crate of it so it was new again. With a little bit of lemon and a crocheted stubby holder, it was the perfect end to a pretty perfect day. Then as the oven hit 150 degrees, in went the lentil stew and with the oven door ajar it stayed there overnight. By morning it was rich and thick and tasty. Perfect for that night's dinner with a squeeze of lemon and a sprinkling of parsley and local fetta and "spooned" from the bowl with a slab of day old bread smeared with Bega butter. I mean really, can life be any better than this? 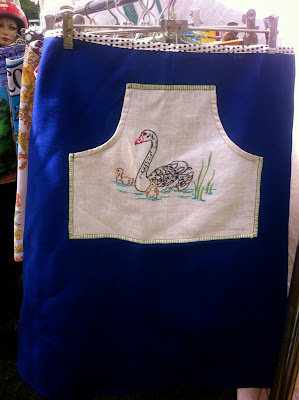 On sunday Gab and I spent a lovely, sunny day at the Candelo Markets. 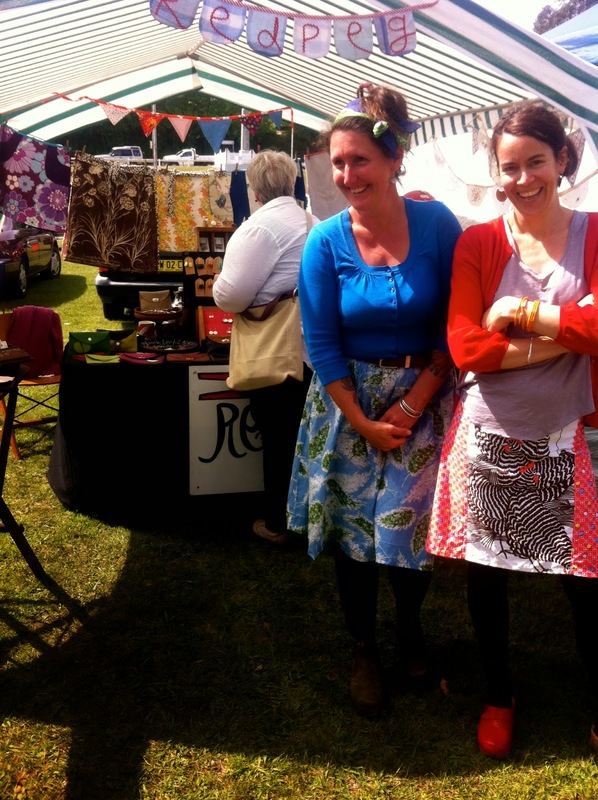 I was selling skirts, doily and teatowel bunting and crocheted stubby holders, and Gab was selling her beautiful recycled silver jewellery and the most adorable, colourful recycled leather wallets of all time. The skirt she's wearing in this picture (it has chickens on it!) was a trade for a spunky broad-bean-green leather wallet for Pearl. 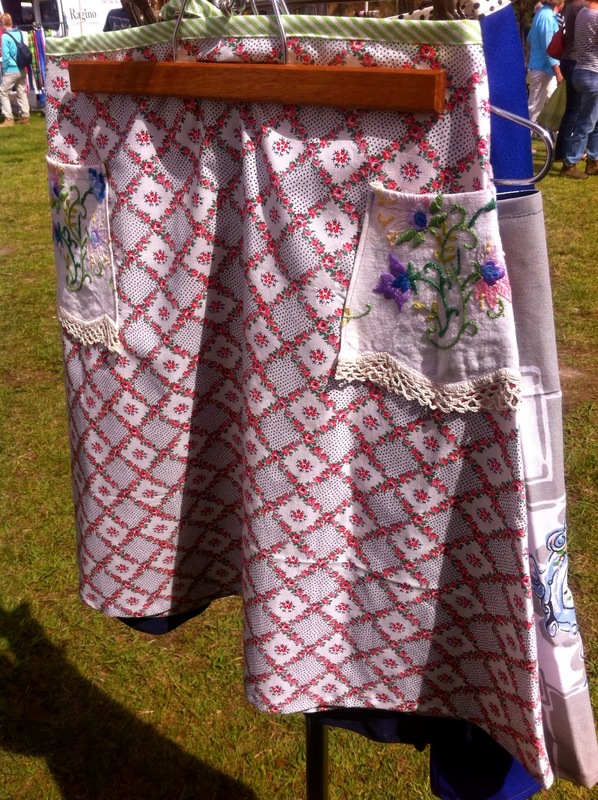 For those of you who can't make it to Candelo for the markets, I thought I'd post some skirts on here so you can have a virtual market experience. Also, I'm selling my market skirts for a mere 50 bucks, so they're something of a bargain! vintage blue and red floral print A-line with vintage kids' print pockets (it's a little hiking person and green trees on a red and white polka-dot background) (size 14); vintage pink floral print bolero (size 14) and doily bunting, $15. It's an all home grown, home-made version of Matthew Evans' version of choucroute garnie, from Winter on the Farm. Even though it's not winter any more, and we're currently preserving artichokes, we hadn't yet cooked this recipe for want of some good pork sausages. Now we have them. Because we made them. We recently had the extreme pleasure of watching the Farmstead Meatsmith movies. We watched them several times, because the kids were heavily into them too. Oscar even declared that he was not going to go to Uni because he wanted to be a farmer. Cool! If you haven't seen Farmstead Meatsmith, and you're interested in reconnecting with your food, I'd encourage you to have a look. They are incredibly beautiful, and the Farmstead Meatsmith man, Brandon, is eloquent, passionate, handsome and charming. Makes for good watching, let me tell you. 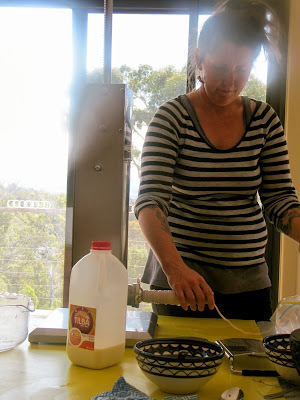 He talks about the value that is inherent in food that's been prepared by your own hand - the social value of getting together with friends to prepare and preserve food, but also the value you place in the food because of the work you put into it. We are lucky enough to be experiencing this on a more and more regular basis as we work towards our goal of only eating food grown/killed/prepared by us or someone we know. And this morning, after unveiling our first home-made ham, it was taken to a whole new level. The ham, fresh out of its night spent wrapped in muslin, then wrapped in lucerne, then put into the camp oven, then baked. 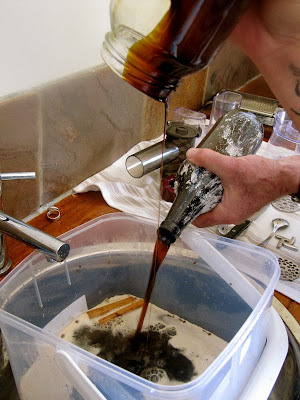 The ham was brined for 6 days (molasses and home-brew stout brine!! ), then hung, then smoked for 6 hours, then baked overnight in our wood-fired oven in a bed of lucerne hay. I cannot even begin to describe the taste of this ham, and I don't want to go on and on about it - you should try it for yourself! - but I will say that the pure plain goodness of the thing comes, of course, from its deliciousness, but also the amount of work and love that went into making it. Oh, and of course the pig was happy and killed quickly in the paddock where it lived (= no stress). That's an important bit, and not to be overlooked. In addition to this ridiculous ham (Texture! Taste! Joy! ), we also spent 2 days preparing the rest of the pig in many and sundry other ways. This was an experience in itself, involving friendship and sharing and experimentation and learning. It was ace. We gathered at our lovely and ever-generous friend David's house to take advantage of his facilities (running water! proper kitchen!) and excellent view. We used Thea's mincer to mince up the kilos and kilos of mince required for the dozens of various sausages we made, and used the very lovely brand-spankin-new sausage cannon purchased with proceeds of the July Teatowel-a-thon to stuff said sausages. Thanks y'all!! We made Calabrese salami, which is a super-basic but probably-quite-delicious-based-on-our-fried-up-taste-tests recipe out of the book, Preserving the Italian Way. They're currently hanging in David's cellar, half smoked, half plain, just to see what we like best. We made Calabrese pancetta from the same book, and Matthew Evans' pancetta from the Gourmet Farmer Deli Book. The pancettas both involve dry-curing for 4 days, though the Matthew is cured in herby salt, and the Calabrese in plain salt, then washed in red wine (!) and rubbed with chilli before being hung. They both have to hang for around 6 weeks. Needless to say, we're just a tad excited about them being ready to eat. We made English pork sausages from the same book, and bratwurst and a fresh chorizo (which is almost already all gone on pizzas and spanish rice and chickpea stew and a rabbit stew we cooked on the fire with Rohan Anderson. We got pork roasts and chops, we had crackling and of course, the hams. We're feeling like we now have enough pork to last us at least half a year. We had fun, and we learnt some stuff, and we feel proud of our efforts and proud to share all our porky goodness with our friends. And we feel happy that we had a hand in making our food - making it delicious, preserving it, and just generally getting more involved with it than a cursory visit to the deli counter. I can guarantee it's more delicious for the love that went into it.